To design and install sound insulating partitions and doors, to form 3 new offices at Kobalt’s UK headquarters; in particular, a meeting room for listening to amplified music, in close proximity to an open-plan office for accounts staff (requiring an undisturbed working environment) and a private office for the accounts director (requiring an undisturbed and confidential working environment). 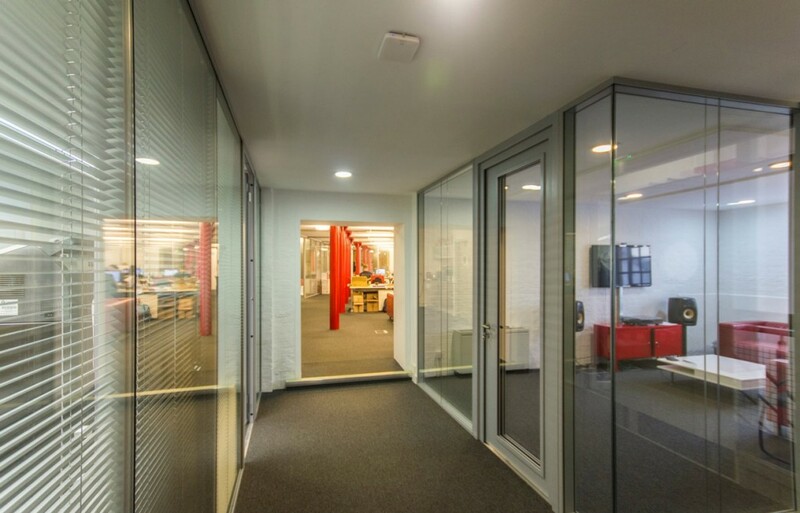 To design and install the doors and partitions to maximise natural light inside each office space and across the floor area, generally. To undertake the installation in a highly organised and coordinated manner, minimising disruption to Kobalt’s day-to-day operations. A site survey was carried out, including sound testing – measuring the amplified music levels earmarked for the meeting room, simulated by the relevant Kobalt personnel. 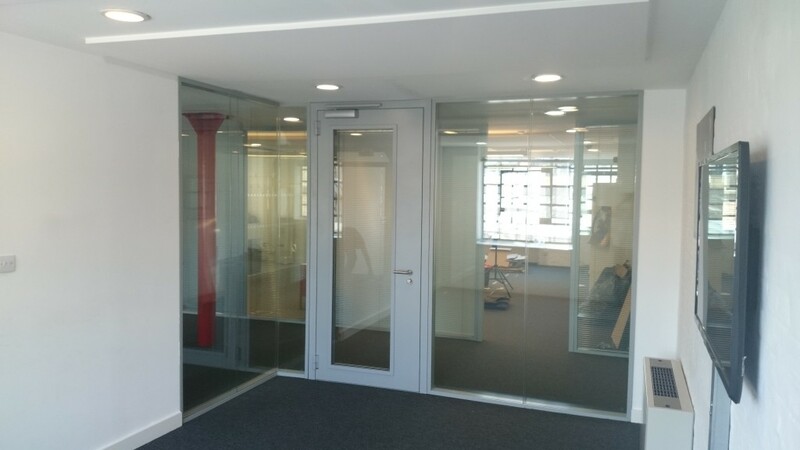 Based on the data recorded, the doors and partitions for the meeting room were specified at *Rw53dB and at Rw41dB for the accounts offices. Technical drawings were drafted and signed-off, by the client, before manufacturing commenced. *Rw is the weighted sound reduction in dB (decibels) and it describes the airborne sound insulating power of a building element. It is a laboratory-measured value, as defined in ISO717 Part 1. 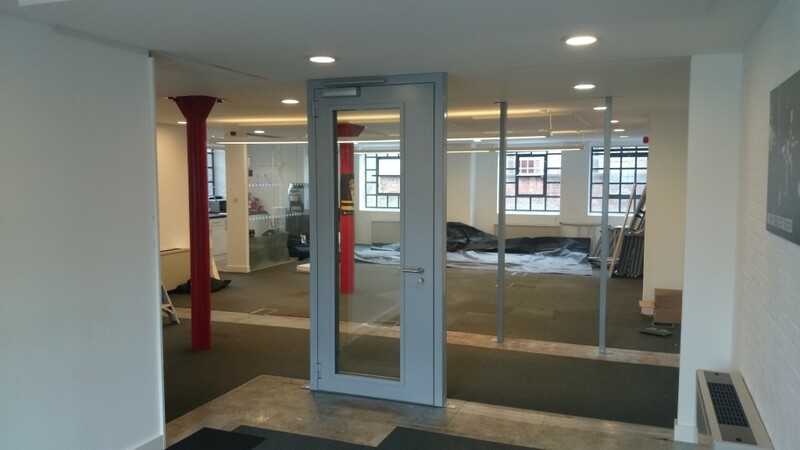 (1) Installation of acoustic door frame and door for meeting room and door posts for both accounts offices. 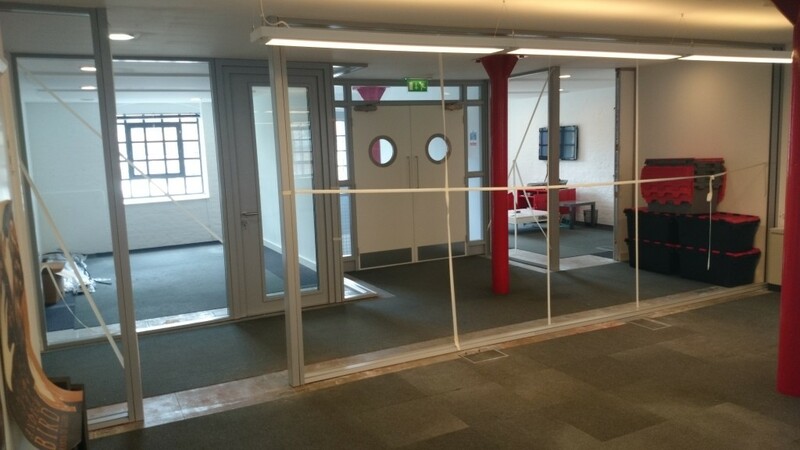 (2) Partition wall, ceiling and floor tracks fitted for all 3 offices. 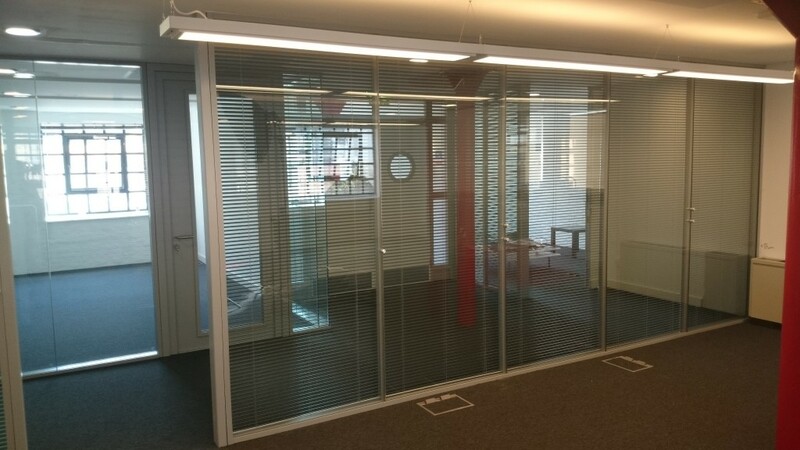 (3) Acoustic glazing fitted to partition wall, ceiling and floor tracks, for all 3 offices (including integrated blinds for both accounts offices), followed by installation of acoustic doors for both accounts offices. On completion, all 3 spaces were tested and inspected to verify compliance with the pre-specified acoustic performance criteria. The project provided Kobalt with 3 new work spaces, each acoustically fit-for-purpose; delivering sound insulation between offices, such that the accounts department can function at full capacity, without fear of noise disturbance from the nearby meeting room. 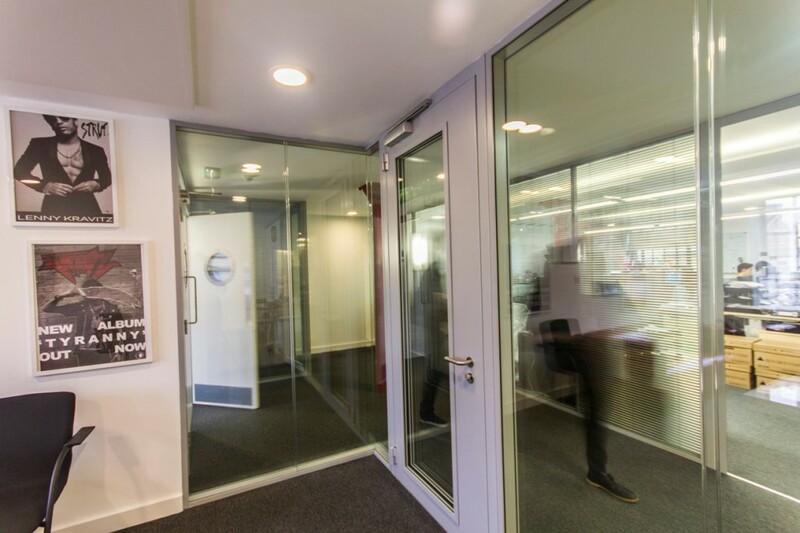 Through the use of fully-glazed doors and partitions, the installation maximises natural light. Subsequently, all 3 spaces feel bright and airy; raising energy levels and increasing productivity. 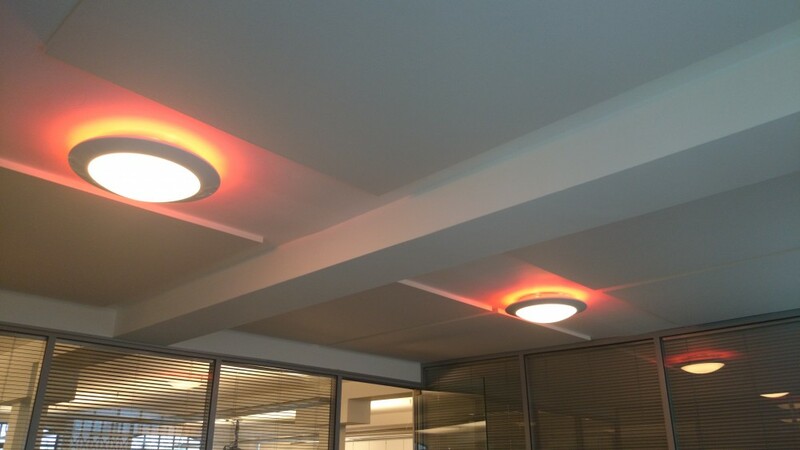 Additionally, Kobalt commissioned Mute to design and install a ceiling-mounted, sound absorbing system, to 15 meeting rooms, specifically to improve speech clarity and facilitate more audible communication during conference calls.